Palmyra temple damage an 'appalling loss' Jump to media player Historian Dan Cruickshank says any damage done to to the the Bel Temple by the Islamic State (IS) group is on a par with destroying the Parthenon in Greece or Chartres Cathedral in France. Cruickshank: 'Palmyra's fall to IS appalling' Jump to media player Historian Dan Cruickshank explains the significance of the ancient city of Palmyra, and describes IS's destruction of historical sites as 'cultural terrorism'. 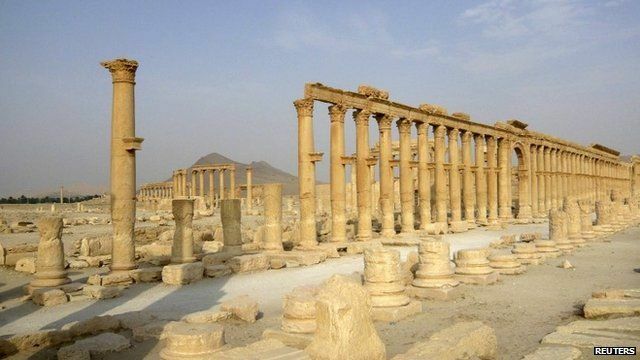 IS 'destroy ancient Palmyra temple' Jump to media player Islamic State militants have destroyed Palmyra's ancient temple of Baalshamin, Syrian officials and activists say. Why does IS destroy ancient history? Jump to media player The Islamic State (IS) group has taken over the ancient city of Palmyra, and there are growing fears it could be destroyed. Why? Syria's Palmyra 'in IS hands' Jump to media player Islamic State militants take near complete control of the Syrian city of Palmyra, home to some of the world's most magnificent ancient ruins. Palmyra archaeologist 'killed by IS' Jump to media player The archaeologist who looked after ancient ruins of Palmyra in Syria for 40 years is reported to have been killed by Islamic State (IS) militants. The United Nations has released satellite photos which appear to show that the most important temple in the ancient Syrian city of Palmyra has been destroyed by Islamic State militants. IS captured Palmyra in May. Historian Dan Cruickshank said any damage to the temple was ''an appalling loss'' - on a par with destroying the Parthenon in Greece or Chartres Cathedral in France.